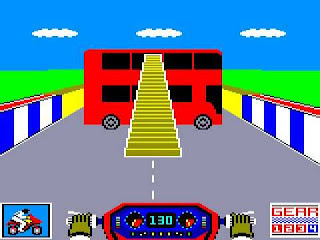 3D Stunt Rider is an extreme sports game that's exclusive to the Amstrad CPC. As a daredevil biker, your job is to set a new world record by leaping over London buses. There's an increasing number of buses to jump and the opening scene takes place in a P.O.V. perspective, with the fire button accelerating, and Up and Down controlling wind resistance. You must also adjust for the side wind and aim for the centre of the ramp to avoid crashing into a bus. If successful, the action then moves to a side-on view and leaning back at the top of the ramp gives you an even greater height and distance. With the bike in the air it now needs to be carefully controlled to ensure the wheels land perpendicular to the road; a safe landing earns you 100 points for each bus cleared, but experts can net an additional 1,000 point bonus by landing on the down ramp. As you set off, the first-person viewpoint is spectacular with responsive controls, neat scaling effects and an impressive sense of speed. While the graphics are lacking in detail I love how your rider's hand is animated when he changes gear! Controlling the bike in mid-air is intense and it's enjoyable tussling to land it at the correct angle. Doing so is satisfying but landing on the down ramp for bonus points is seemingly impossible due to the exact timing, speed and control it requires. An obvious feature that's missing is yard markers during a jump; this could have worked similar to the javelin event in Track and Field (1983, Arcades) to challenge you to try and beat your previous best distance. As a whole, the action is okay in short bursts, but after a handful of levels you find yourself repeating the same thing with the strengthening wind acting as the only additional gameplay mechanic. 3D Stunt Rider is an above-average sports title and its mini-game style simplicity makes it easy to pick-up-and-play. While there's no extra modes or options to sink your teeth into, what's here is fun and you'll likely find yourself booting it up for an occasional ten minute blast. Random trivia: The game also features speech if an Amstrad SSA-1 Speech Synthesizer is plugged into your CPC.